Here are 2 videos from Jennifer Linder, M.D. of PCA Skin talking about her (and my) reasoning for using 'quality' products...you will get better value and better (healthier) skin paying for a cosmeceutical grade product than a department store or drug store product. You can't compare ounces to ounces and dollars to dollars. Does the quality of the products you apply to your skin really make that much difference? Can you buy something from the drugstore that does the same thing as an esthetician's products? Sometimes, but usually not. If you can buy a comparably effective product at the drugstore, or department store, then it will have a comparable cost-per ounce I have found that you will find it more expensive than my guaranteed high quality products. However, cost is not everything! I have done extensive research (and constantly continue to do so), to ensure that the products I carry offer the best value for the highest quality ingredients available. I use ingredients that have proven to make the changes you are after. I include newly developed ingredients as they become available if they are better, or proven to provide a previously unavailable benefit. Pick up at my office or have me mail them to you. Most orders will mail for $6.oo. 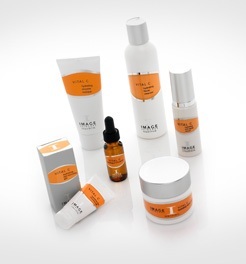 I carry the full line of Image Skin Care. I love the price for the highly active and properly balanced pH of the products. The Vital C line is excellent for aging and sensitive/sensitized skin. I recommend their Vital C Serum for almost all skin types and problems. PCA (physicians care Alliance) : this product line has products tested by the dermatologist who developed them in her own practice. I have a lot of respect for her knowledge and sensitivity to what is workable/good for the client. In this line I can provide you with some very active ingredients. I also am proficient in the peels from this line. dermalogica has some excellent tried and true products. I know I can go to this line when your skin is ultra sensitive, or needs a beginning product line to condition it. But that's not all dermalogica has to offer now a days! In the last few years dermalogica has come up with some highly therapeutic products especially in their Age Smart and Chroma White Rx lines. Their Barrier repair cream makes an awesome primer for makeup application that is actually good for your skin! I will match or beat any online price you can find on dermalogica.